Zerochol is a 100% natural dietary supplement containing plant sterols. Plant sterols are present naturally in small quantities in many fruits, vegetables, nuts, seeds and grains and other plant sources that help lower your cholesterol. It has been proven that consuming plant sterols in a dosage five times higher than the average dietary level, contributes to a significant decrease in the blood LDL cholesterol level. 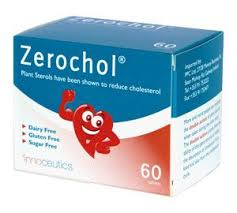 Zerochol which is made from natural plant sterols, can help lower cholesterol in just six weeks. The plant sterols in Zerochol® work by partially blocking the uptake of cholesterol in the gut, so less gets absorbed into the blood stream. Cholesterol is naturally produced by the body as well as been found in the food we eat. Both these sources of cholesterol enter the bloodstream, and can be blocked by this product. According to new European research, they have been proven to lower blood cholesterol, which may reduce the risk of coronary heart disease. Zerochol from New Harmony Health Food Store in Tuam County Galway, available over the counter or through online shop nationwide.